Great news for multi-pitch fans. Lyle Knight, Rob Birtles and Gary Wolkoff have just completed a 17 pitch epic on the Yak, south of Merrit. Rob Birtles describes the route. The climb was a 4 year effort by Lyle, Gary and I. It’s was a journey to put this thing up. To date it’s the hardest climb on yak. Climbing style – slab/crack. It’s a mixed climb so take a rack of nuts and cams to 4″ . Truck stop which is down hill and west of the yak trail head. Trail – the trail head is 500 meters east of the parking area. Look for the flagging tape and other markers and follow a well marked trail which climb stage slope in the trees to a boulder field. Once at the Boulder field follow the flagging tape to the base of cliff. Cardi-yak Rythm starts at the high point if the trail along the base of the cliff. A bolt At the cliff marks the start of the climb. Have fun! Lyle Knight describe the route (taken from Facebook). For anyone who knows the Coquihalla Highway that runs beneath the south face of Yak Peak you probably know that the highway has a literary flare. From Dru on Clubtread, “Andrew McCulloch, who engineered the complex series of bridges and tunnels through Coquihalla Canyon was an avid reader of Shakespeare and would often recite passages from the plays to his workers around the evening campfires. As a result, many of the areas in the Coquihalla Region are named after characters in Shakespearean literature, such as Iago, Romeo, Juliet, Lear, Jessica, Shylock and Portia.” One option we considered as a route name was “The Twelfth Night” from another Shakespearian play, which felt especially poignant driving home in the dark after our 12th and final long day on the face. Most days were somewhere between 16 and 20 hours. Today I’ve posted a single picture to reflect on the ongoing conversation on climbing ethics we had during the drive, and on route, over those 12 long days. On Yak, I’d imagined a ground-up first ascent comparable to the other routes on Yak. While many of the natural “plum” lines had been picked, there were still many weaknesses that could be linked. Rob and I talked options and I expressed my ground-up preference. He was willing to entertain the idea, however was advocating for a far-more pragmatic approach. Rob floated the idea of creating a more safe and accessible route up the face. 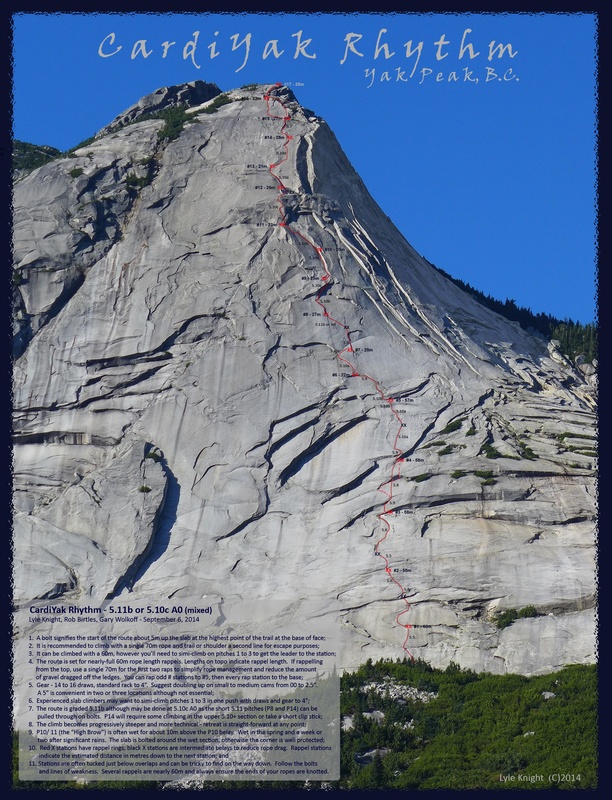 He pictured a route that would allow moderate climbers the ability to safely enjoy the wide expanses of clean granite without having to commit life and limb to do so (including our own!). In comparison, Yak Crack has its loose, run-out corners and Reality Check it’s run-out, 35m 5.10 pitch. All of the corner climbs on the south-east side rely on a higher level of expertise both in terms of gear placement and moving in the mountains under variable conditions. Reality Check, put up by Gary Wolkoff and Rick Cox in 1992, was our biggest consideration on style. The first half of the route is on easy crack climbing; however there is a single, 35 metre, 5.10 slab pitch with 5 bolts put up by Rick Cox on lead that deters most parties. It was a tremendous effort and a testament to Rick’s ability to pull through under tricky conditions. However, it makes the climb inaccessible to most climbers today due to the run-out nature. It has sent many experienced climbers to hospital and I took my own tumbling 60 footer, lucky to escape with only a broken helmet. The second half of the route is now a trade-route link-up with the popular first half of Yak Crack. And as a result, the second half of Yak Crack after the crossing is now neglected. 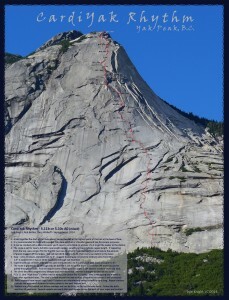 It is loose and runout, and overall is considered by many to be marginal climbing for the objective hazard. There are some great features on it – the upper, 2-pitch 5.9 corner is world-class. However, there is too much unprotectable, crumbling terrain to get there. As weekend climbers with day jobs, we felt that in order for us to establish this kind of route it would take considerable planning and a combination top-down/ bottom-up approach. We started by installing the belay/ rappel stations as a means to develop the route and provide a quick escape if the weather turned. We had studied the face in detail, rappelled with photos and linked as many natural features as possible. Between the three of us we had enough experience to determine reasonableness for at least ourselves and hopefully those that follow. The easier slab pitches (1 through 3 and 15 through 17) were done ground up. We felt the bolting on those sections could be sufficiently and consistently fixed on lead without having to run-it-out to adequate stances. We top-roped the balance of the pitches to first determine the best location for the bolts before placement. Most of the gear sections were led without first placing any bolts and run-out sections or areas of marginal gear were supplemented afterwards to keep the route consistent bottom to top. The P11 station on Yak Crack occupied the lion’s share of our ongoing conversation around ethics. At the time it was installed at the junction with Yak Crack it made sense; for those that have climbed Yak Crack, it’s at the transition into the loose chimney feature and provides a single pitch rap back to the junction with Reality Check. All stations up to this point on Yak Crack have been replaced in the past and this one is about 7m higher than the tangle of webbing over a bulge that was the P8 station. It’s now possible for the belayer to safely watch the climber in the chimney pitch on Yak rather than belay from the rusty ¼” station partway through this pitch. The rock on this pitch is rotten and the climbing run-out – it’s my opinion the conditions are ripe for a catastrophic accident and the new station may help mitigate that. The new station is also a good place for the top of CardiYak’s P11 – we considered putting it a few metres lower and out of reach of Yak Crack, however there isn’t much of a natural stance. Gary had the conversation with Rick (first ascensionist on Yak Crack) about the station and conveyed to Rick that we were prepared to move it. Rick wasn’t crazy about the additional station although understands the rationale. He is most concerned about Yak losing the integrity of the original ascent which has undoubtedly been eroded over the years. It should be noted that it didn’t have any bolts on the first ascent. The conversation around the P11 station went on for the years we developed the route and both Rob and Gary felt it was the right call while I was still unsure. On Day 10 we brought the breaker bar up in case we decided to make the move. Gary and I had one more conversation at the top of P11 and closed the issue in our minds; we agreed the location made sense so, for better or for worse, the station remains. There are those that feel Yak Peak should be held as bastion for ground up ethics and I can respect their position although it’s not one I share. And terms like “safe” and “accessible” that we used as development principles will raise the ire of others which is also reasonable. We all hold our own set of values that we can use to set our direction. Between Rob, Gary and I we have nearly 90 years of climbing experience and certainly didn’t go about the development of CardiYak Rhythm lightly. While you’re on the route I hope it’s apparent we did our best to find the balance – to spend the time and energy to develop a route that will serve climbers well to safely exploring the amazing south facing sweep of Yak Peak.